All items here are 100% brand new. All prices shown here are in SGD. All prices include normal postage(Unless Otherwise stated). International orders are welcome. No hidden costs. Items sold are not exchangable or refundable. No swaps of items are allowed. Buyers are not allowed to back out once orders are confirmed! Money paid would be forfeited. Mode of payment: Bank transfer to POSB/DBS or UOB or PAYPAL. Please try to transfer the full amount to my account within 3 days. I accept concealed cash as well but at buyer's own risk! Registered mail is $2.24. I will not be responsible for any lost by normal mail (including concealed cash)Registered mail is strongly recommended instead. Meet ups are available for collection of purchase at a delivery fee of $6. No dead buyers or else I will blacklist you. Please clarify all doubts before purchasing/ordering. Bulk purchases & wholesales are available. Discounts varies with each item. Double-layered internal lining for safety precaution. 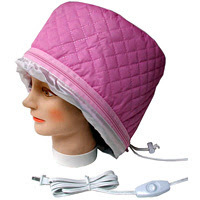 How to use the Treatment Heating Cap? After washing hair, towel dry hair, apply lavishly your favourite treatment lotion/cream especially on the tip of your hair. Put on the treatment heating cap and plug in the 2-point switch into your power point and turn it on. Cap will slowly heat up. Leave on for around 10 -15 minutes as desired. Remove cap and leave hair to cool down to prevent hair follicles from being damaged when you just wash off after heating. Wash with cold water after hair has completely cooled down to give your hair the shine and sheen! Voila! Caution! If you feel uncomfortable, which is unlikely, for any reason, remove the cap immediately.